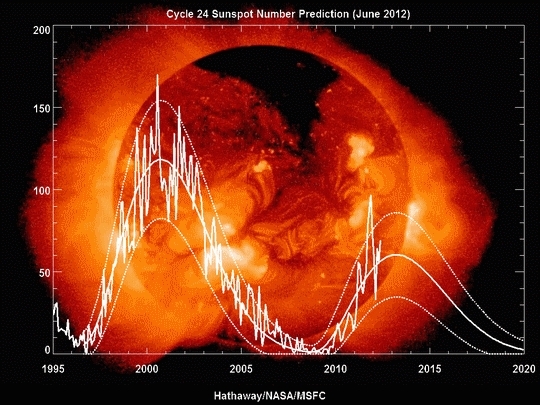 The current prediction for Sunspot Cycle 24 gives a smoothed sunspot number maximum of about 60 in the Spring of 2013. We are currently over three years into Cycle 24. The current predicted size makes this the smallest sunspot cycle in about 100 years. The prediction method has been slightly revised. The previous method found a fit for both the amplitude and the starting time of the cycle along with a weighted estimate of the amplitude from precursor predictions (polar fields and geomagnetic activity near cycle minimum). Recent work [see Hathaway Solar Physics; 273, 221 (2011)] indicates that the equatorward drift of the sunspot latitudes as seen in the Butterfly Diagram follows a standard path for all cycles provided the dates are taken relative to a starting time determined by fitting the full cycle. 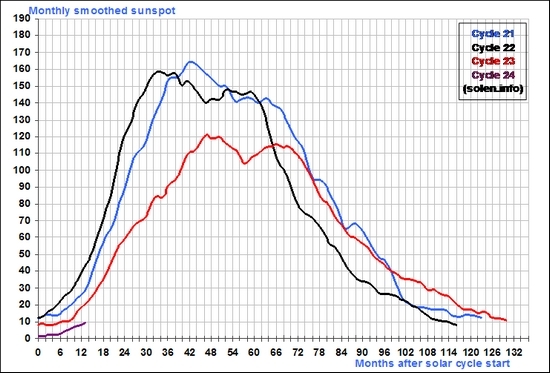 Using data for the current sunspot cycle indicates a starting date of May of 2008. Fixing this date and then finding the cycle amplitude that best fits the sunspot number data yields the current (revised) prediction. Over the centuries, mankind has experienced tremendous rainfalls and massive floods, monster hurricanes and typhoons, destructive tornadoes, parched-earth droughts, strong gales, flash floods, great snowfalls and killer blizzards, lightning storms sent down from the heavens, blind dense fogs, freezing rain, sleet, great hail, and bone-chilling cold and even an occasional mudstorm or two and in-between, periods of warm sunshine and tranquility. And we are still here. We are perhaps a little battered and bruised from the wear. But there is nothing new in the weather to fear because we have been there before. We have learned to cope. We have developed knowledge, skills and tools to reduce the effects of weather extremes. Today, every time a heat wave or a great flood occurs (such as those in Russia and Pakistan this year), voices arise claiming this is more proof of man-made global warming. I wonder to myself if these voices are intentionally ignorant of historical weather extremes or just dishonest. 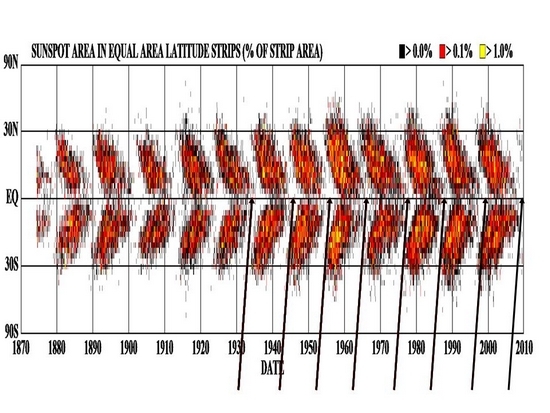 Drew Shindell, NASA modeller who works with James Hansen showed here in a paper in Science (2001) how low solar periods with reduced ultraviolet leads to less ozone chemistry warming in high altitudes over low and mid latitudes. This apparently allows for cooling and expansion of the polar vortex and more blocking in high latitudes (a negative NAO/AO). 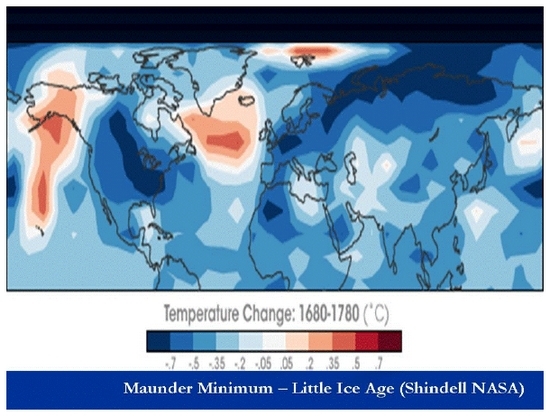 Here Shindell shows the difference between the Maunder Minimum temperatures of 1680 and those of much more active sun period 1780. You clearly see the negative NAO and AO and a cold winter in the continents in the low sun period. Writing in Environmental Research Letters (2010), Mike Lockwood et al. have verified that solar activity does seem to have a direct correlation with Earth's climate by influencing North Atlantic blocking (NAO) as Shindell has shown. In the ICECAP section on solar cycles, we explain why the sun is a driver for climate changes over time. Historically, the sun undergoes changes on periods of 11, 22, 80, 180 years and longer. When the sun is more active it is brighter and warmer and when it is warmer, we are warmer. This direct effect is relatively small varying only 0.1% during the 11 year cycle and maybe 0.4% for the longer term. However, there are accompanying effects from other solar changes that appear to magnify these irradiance cycles. An active sun is accompanied by increased ultraviolet radiation. Though the brightness/irradiance on the 11 year scale may only increase 0.1%, the ultraviolet changes by several percent especially at the lower wavelengths (X-rays) where factor of two changes may take place. We have had some extreme conditions the last few years – of cold, heat, snow and rain. Detailed summaries on the cold last winter can be found here and on the hot summer here. Both were memorable seasons indeed. Though the second author did an excellent job detailing the summer records and did mention the amplified and frozen jet stream, he went on to say man made global warming contributed to it. The sun is the major driver for climate. The variations in the sun including irradiance, ultraviolet warming through ozone chemistry, galactic cosmic ray diffusion through the solar wind cause variations in the earths atmospheric and surface temperatures, changes in the jet stream and affect the tendency for blocking events. The sun is a factor probably through its effect on blocking also in how persistent patterns are which leads to anomalies to build for the seasons. The actual anomalies vary year to year with other factors such as ENSO and the state of the ocean multidecadal cycles – PDO and AMO. This was posted a year ago by Anthony Watts. I have reposted and added a 5 part video series featuring Svensmark and other scientists. “In fact global warming has stopped and a cooling is beginning. No climate model has predicted a cooling of the Earth - quite the contrary. And this means that the projections of future climate are unreliable,” writes Henrik Svensmark. The star that keeps us alive has, over the last few years, been almost free of sunspots, which are the usual signs of the Sun’s magnetic activity. Last week [4 September 2009] the scientific team behind the satellite SOHO (Solar and Heliospheric Observatory) reported, “It is likely that the current year’s number of blank days will be the longest in about 100 years.” Everything indicates that the Sun is going into some kind of hibernation, and the obvious question is what significance that has for us on Earth. If you ask the Intergovernmental Panel on Climate Change (IPCC) which represents the current consensus on climate change, the answer is a reassuring “nothing”. But history and recent research suggest that is probably completely wrong. Why? Let’s take a closer look. Solar activity has always varied. 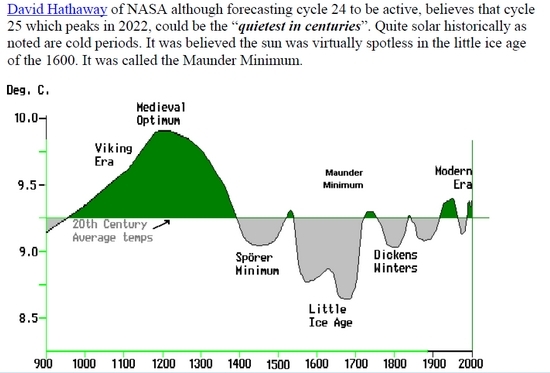 Around the year 1000, we had a period of very high solar activity, which coincided with the Medieval Warm Period. It was a time when frosts in May were almost unknown - a matter of great importance for a good harvest. Vikings settled in Greenland and explored the coast of North America. On the whole it was a good time. For example, China’s population doubled in this period. But after about 1300 solar activity declined and the world began to get colder. It was the beginning of the episode we now call the Little Ice Age. In this cold time, all the Viking settlements in Greenland disappeared. Sweden surprised Denmark by marching across the ice, and in London the Thames froze repeatedly. But more serious were the long periods of crop failures, which resulted in poorly nourished populations, reduced in Europe by about 30 per cent because of disease and hunger. Who is Joe D'Aleo? He was the first Director of Meteorology at cable TV's Weather Channel, and Chief Meteorologist at the Weather Service's International Corporation. He has over 30 years experience as a meteorologist. Kim Greenhouse recently interviewed Joseph D'Aleo and he was asked about global cooling: Listen to the interview HERE. "I believe we're headed into at least a Dalton minimum kind of cooling which could be a degree or two Celsius below globally for over the next couple of decades," says D'Aleo. "Three degrees Fahrenheit globally. You'll still get your heat waves. Winters will be colder and longer, more extreme. There will be plenty of snow, and snow in places where you usually don't see it. "The point is that cold is much more dangerous than warmth. This could create crop failures and famines and plagues. "We believe strongly that cooling is coming. "We're preparing for something that is not coming." We have seen hot summers in 1933, 1944, 1955, 1966, 1977, 1988, 1999, 2010. Notice a pattern? The years are 11 years apart. This 11 year cycle may be a coincidence but if so a 1 in 256 chance one. In some years the heat was concentrated in one month (1966 it was July), in others it was throughout. What else has an 11 year cycle? - the sun of course. The solar cycles average 11 years. When new solar cycles begin the new spots are in higher solar latitudes and gradually move equatorward. During transitions you typically have old cycle spots near the equator and new cycle spots at higher latitudes. The 11 years above have been during these transitions. A coincidence? We’ll leave it to our solar expert readers to speculate whether this is solar driven and possible mechanisms. Other common elements in some of the years include an El Nino winter giving way to a La Nina summer and strong rebound from a very negative winter negative Arctic Oscillation (AO) pattern. Comaprison of the last four solar cycles, note how cycle 23 was long and our recovery out of it into cycle 24 very slow. This is more like the cycles in the early 1900s and especially the early 1800s. JD. The authors of a newly published paper on the role of the sun’s variability on global temperatures overstate their case that there has been no impact of solar variations on the earth’s temperature history during the past several decades. Antithetically, changes to the sun are generally known to influence the earth’s climate on all time scales, from eons to hours. However, the difficulty comes in trying to fully measure the magnitude of the sun’s variability and then to understand how such changes result in changes to the earth’s climate. In a new paper, authors Lockwood and Fröhlich seem to ignore these difficulties and uncertainties, dismissing any work on this complex subject that doesn’t agree with their pre‐conclusions.